The Tineo props up Pinnacle's vast range of bikes across all disciplines and is designed as a first step into the world of cycling. Pinnacle being an Evans Cycles house brand gives you peace of mind that you're in the hands of an outfit that knows a thing or two about bikes. A balance bike is all about learning and developing confidence on two wheels and the Tineo has a good range of features to get your youngster rolling: adjustable saddle and bar, a rear brake, a footplate, and even a limit lock to stop the bar from spinning. As requested by his nibs, the test version we had was bright orange with black finishing kit. All in all a pretty cool looking bike. The Tineo is suitable for young riders between the ages of two and five, but size is a more important indicator when it comes to kids' bikes. The height range for the Tineo is 85-110cm, with the saddle and bar height both adjustable. Charlie started with everything at its lowest setting, but this has been raised slightly over the few months he's been using the bike. The frame is made from Pinnacle 6061 aluminium, and it's robust but not too weighty for small bodies to heave around. The thick down tube provides most of the strength, with a thinner top tube spanning across to the seat tube for extra support. Both the down tube and top tube sweep down low, creating an almost 'step through' style frame so it's easy for little 'uns to get on and off. At the bottom of the frame is a built-in footplate, a small ledge that riders can rest their feet on as confidence grows and they start to pick up speed and balance for longer distances. Charlie's confidence hasn't quite reached that stage, but it's good to have it there for when he progresses. The steel fork does add a bit of heft, but with the whole bike tipping the scales at 4.9kg it's not overly heavy. There are certainly lighter balance bikes, but with the steel fork, built-in footplate and a brake thrown into the mix it was never going to be the lightest bike out there. 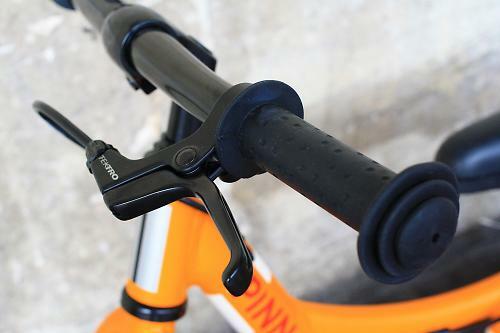 At the steering end, the 440mm-wide alloy flat bar has a slight sweep backwards, with black grips and wide rubber rims on both ends to help stop small hands slipping off. And, of course, there's the most important feature on any toddler's bike: a bell. The Tineo also has the added bonus of a rear V-brake, by no means a 'must have', more of a 'nice to have'. Charlie paid very little interest to the lever at his early stage of riding, and in fact it's too much of a reach for his small fingers to grab. 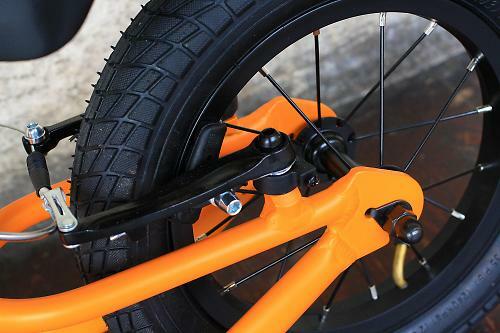 But the brake is something that will become useful for more confident and speedy riders, especially as they progress towards a proper pedal bike. Introducing youngsters at an early age to something that's a vital component of a bike's set-up certainly can't do any harm. 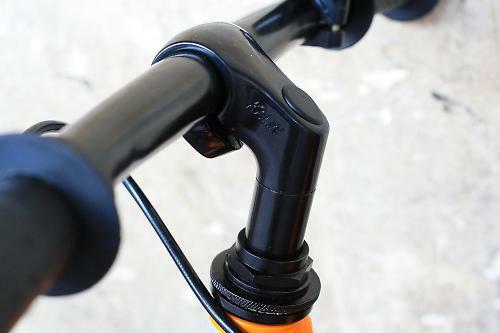 A 30mm quill stem holds the bar in place, combined with a headset with proper bearings, something you don't always find on a balance bike. 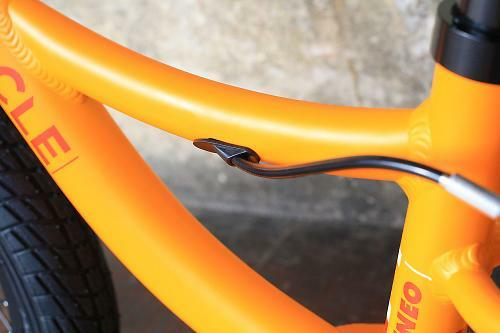 There's also a useful limit lock on the bar, meaning your little one can't spin the bar or oversteer, a handy feature to prevent spills as they're getting used to the bike. 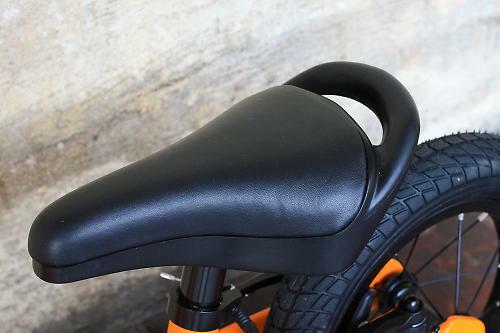 The saddle is black plastic with a padded top and an integrated seatpost. There's a really handy grab handle on the back of the saddle which is good for either supporting your child as they gain confidence in balancing by themselves, or for carrying the bike when their legs start to get tired (or they get bored). Finishing off the mini-build, the 12-inch wheels have an alloy rim with steel spokes, and chunky tyres absorb the lumps and bumps they get scooted across. 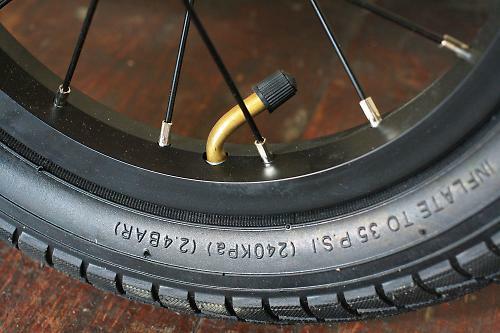 The tyre valves are angled, much like on pushchair tyres, making it slightly less fiddly to attach a pump. And like the headset, the hubs also feature decent bearings, a good indication that the bike will last a while, so it'll be good for passing to a younger sibling, or selling on at a decent price. 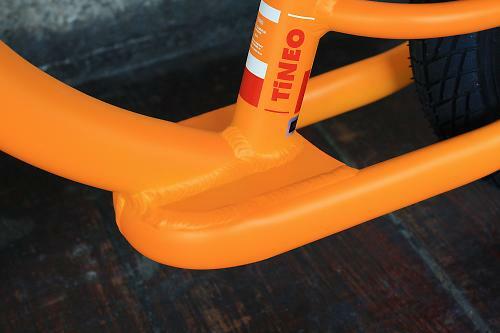 The Tineo comes in three colours: orange, lime green or purple, all with black finishing kit. It retails at £90 (currently discounted to £81), available exclusively through Evans Cycles stores or website. That's roughly in the middle of the price range for a balance bike, and with features like the rear brake, footplate, and decent quality bearings, it's really good value. Let's face it, the period of time your nipper is going to be using a balance bike is relatively short, so it's good to know this bike should still be in good working order and hold its value once you've finished with it. 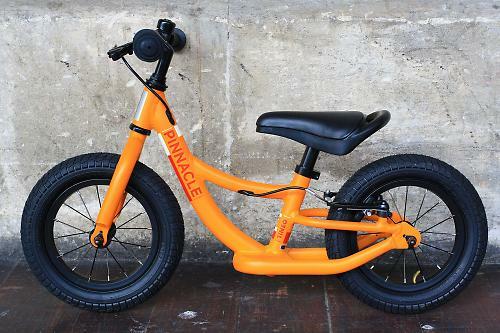 The Tineo is a balance bike aimed at children from 2-5 yrs old. Evans says: "The Tineo is a tiny Pinnacle for those first scooting steps. Children can develop confidence in their balance while moving with a lowered foot-rest frame design and there's a rear brake to help them slow down." Front Tyre: Rubber 12"x 2.125"
Rear Tyre: Rubber 12"x 2.125"
A solidly built bike that will stand up to the rigours of heavy use. Really good, and has a range of features that will help riders across a range of abilities. The aluminium is pretty lightweight, and although the steel fork and extra features like the brake and footplate add a bit to the dial on the scales, overall the weight is low enough for a child to manage. The Tineo falls somewhere in the middle of the balance bike price range, but the features included make it good value for money. Really well. Easy to use, looks good and has a great range of features. The footplate and brake, as well as the build quality. Not much really, possibly a lighter fork would be a minor plus point. The Pinnacle Tineo gets a nine from me and Charlie. It's a great bike for introducing a child to cycling: it's good looking, fun to ride, easy to use, and has features that help at different phases in a child's development on the bike. The price is pretty wallet-friendly too. From watching my niece, who was super confidant on a balance bike then move to a pedal bike and struggle with the concept of pulling a lever to slow down rather than sticking down a foot, I would say a brake is a good thing. This phenomenon is made worse by the extra speed of pedals. I see it has the all important cable routing for increased aerodynamics. Marginal gains and all that.